This book serves as a tool to help patients and families deal rationally with the perplexing and often irrational world of healthcare. It covers the topics and addresses the challenges that experts in a variety of healthcare fields believe to be the most vital to meeting the challenges of decision-making when people feel most vulnerable. 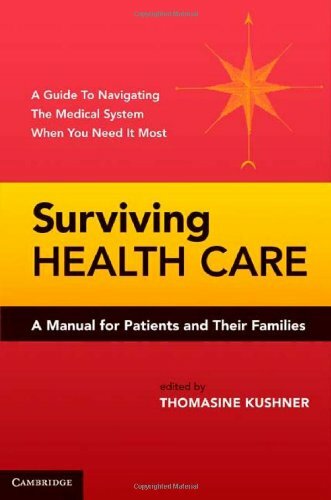 With contributions from leading healthcare specialists, Surviving Health Care: A Manual for Patients and their Families examines a wide array of topics, including advance planning for healthcare, medical emergencies, genetic testing, pain management, and care of elders. It is a unique resource that aims above all to help patients reach their best healthcare decisions. "...Overall, this volume is a very good guide for individuals with little or moderate knowledge of the health care field.... Recommended..."
"This book is an excellent resource for anyone with questions about accessing health care. The work is comprehensive and yet not overly technical. The editor includes chapters with numerous suggestions to prepare a health care consumer to address common health care issues. The central theme is for consumers to be informed so they can be more active in the treatment process as well as advocate for quality care. ..this book is an excellent resource for social work students, practitioners, and educators interested in medical social work. The material included in this book provides a comprehensive, but quick, reference on health care issues that can be used over and over again. This book also presents ethical issues that are central to the delivery of health care, which, given their complexity, can be used to stimulate further discussion."